Any MCQ based objective online question paper contains passage comprehension type questions. Popular entrance examinations like CAT, IIT JEE etc involve such type of questions. 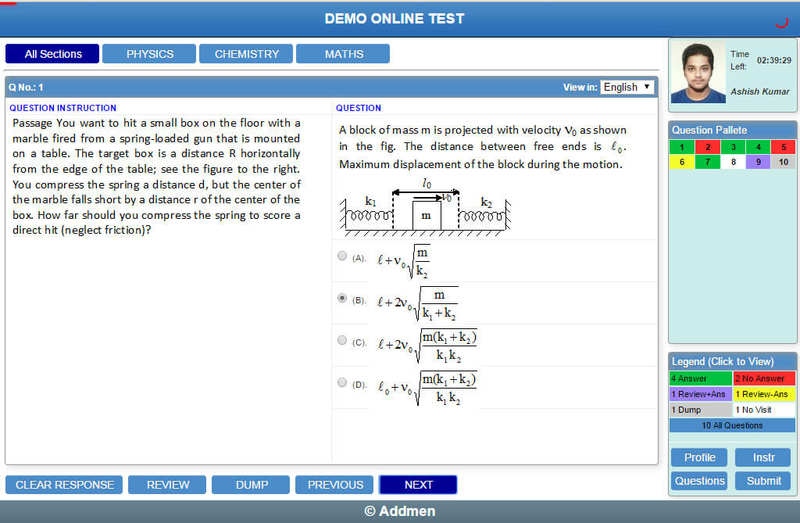 Addmen online exam software supports many types of questions, including column matching, true/false questions, Numeric questions, diagram based questions, passage comprehension, and fill in the blanks with multiple answer choice as well as text fields for entering the answer. Comprehension based questions can contain images for diagrams, graphs etc, as part of the question. You can even create questions that contain complex mathematical formulae. Here’s an example of how a passage comprehension type question looks in the Addmen online exam software interface. You don’t need to write a passage for every question, if there are a set of questions based on the passage. All you need to do is include the passage at the bottom of the Word file and then add the passage question will be repeated for all the questions. Passage Question Instructions will get repeated for all the questions that are defined once in word files, and it will be displayed on left hand side of screen. The actual questions based on the passage will be shown on the right hand side of the screen.